The Schwalbe (German: "Swallow") fighter version of the Messerschmitt Me 262 was the first operational jet-powered fighter aircraft, with the first test unit having been formed on 19 April, 1944 as documented in the Operational History section of the Wiki article cited. Too fast to catch for the escorting Allied fighters, the Me 262s were almost impossible to head off. As a result, Me 262 pilots were relatively safe from the Allied fighters, as long as they did not allow themselves to get drawn into low-speed turning contests and saved their maneuvering for higher speeds. The Me 262 was difficult to counter because its high speed and rate of climb made it hard to intercept. However, as with other turbojet engines at the time, the Me 262's engines did not provide sufficient thrust at low air speeds and throttle response was slow, meaning in certain circumstances such as takeoff and landing, the aircraft became a vulnerable target. Allied pilots soon found that the only reliable way to destroy the jets, as with the even faster Me 163B Komet rocket fighters, was to attack them on the ground or during takeoff or landing. Luftwaffe airfields identified as jet bases were frequently bombed by medium bombers, and Allied fighters patrolled over the fields to attack jets trying to land... On 7 October 1944, Lt. Urban Drew of the 365th Fighter Group shot down two Me 262s that were taking off, while on the same day Lt. Col. Hubert Zemke, who had transferred to the Mustang equipped 479th Fighter Group, shot down what he thought was a Bf 109, only to have his gun camera film reveal that it may have been an Me 262. On 25 February 1945, Mustangs of the 55th Fighter Group surprised an entire Staffel of Me 262As at takeoff and destroyed six jets. The British Hawker Tempest scored several kills against the new German jets, including the Messerschmitt Me 262. Hubert Lange, a Me 262 pilot, said: "the Messerschmitt Me 262's most dangerous opponent was the British Hawker Tempest—extremely fast at low altitudes, highly manoeuvrable and heavily armed." Some were destroyed with a tactic known to the Tempest 135 Wing as the "Rat Scramble": Tempests on immediate alert took off when an Me 262 was reported airborne. They did not intercept the jet, but instead flew towards the Me 262 and Ar 234 base at Hopsten air base. The aim was to attack jets on their landing approach, when they were at their most vulnerable, travelling slowly, with flaps down and incapable of rapid acceleration. The German response was the construction of a "flak lane" of over 150 emplacements of the 20 mm Flakvierling quadruple autocannon batteries at Rheine-Hopsten to protect the approaches. After seven Tempests were lost to flak at Hopsten in a week, the "Rat Scramble" was discontinued. Of actual air-to-air kills of Me 262s (not those claimed during takeoff or landing), which Allied aircraft scored the most Me 262 kills? The Hawker Tempest? The Spitfire? The P-51D Mustang? The P-47 Thunderbolt? The IL-2? The Yak-9? B-17 waist or turret gunners perhaps? Something else entirely? Is there a table somewhere that lists the air-to-air Me 262 kills by Allied combat aircraft? All quotes listed here are from the Wiki article referenced above. Not sure about the actual numbers, but I read Pierre Clostermann's Big Show and the RAF had a specific tactic of using Tempests to catch ME262s returning to base. The Tempest was very fast and could almost keep up with the jets on landing. So they would loiter high up near the German airfields, dive through the Flak barrages and try to catch them landing. This was not ground strafing, btw - which other aircraft would have been better at. It was most likely the P 51. 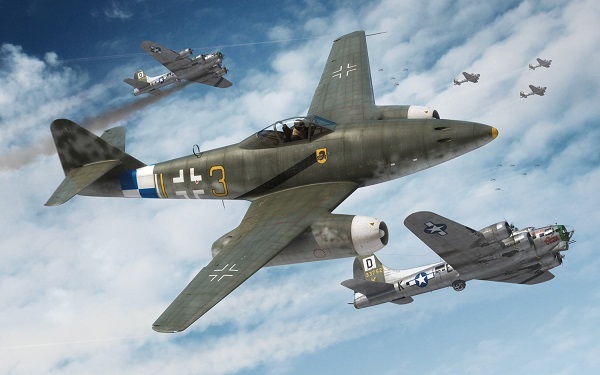 Given that the P 51 was one of the top allied fighters and also one of the most produced it would be unlikely for anything else to get most of the me 262 kills. Not the answer you're looking for? Browse other questions tagged world-war-two military germany aircraft combat or ask your own question. Is there a written history on the Sonderkommando Elbe? Why did US helicopters suffer mechanical failures in Operation Eagle Claw?